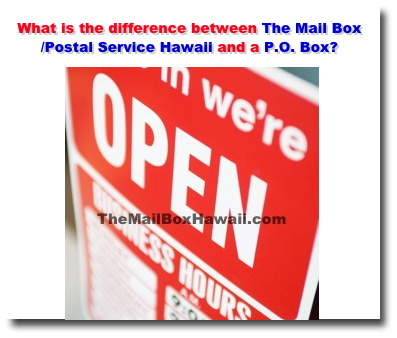 PO Mailbox Honolulu, Hawaii Tip - What is the difference between The Mail Box /Postal Service Hawaii and a P.O. Box? The Mail Box offers you a real street address. This is great especially if you're a running a business, giving you a more professional image than a conventional P.O. Box number. Also, a PO Box cannot accept packages for you. We at the Mail Box can act as your Commercial Mail Receiving Agent and we can accept parcels on your behalf. Apart from a secure and convenient mailbox service, we also offer Mail Forwarding, Mail Tracking, Phone-in Mail check services among others. Click here to view our complete service offerings.